Authorities in China’s coastal Zhejiang province ordered Wenzhou-area house churches to stop gathering on Sunday. Meanwhile, more than 10 additional church buildings have been demolished or had their cross demolished. Local Christians also told China Aid that pastors in the area have been threatened with financial measures should they attempt to defend their church’s building. 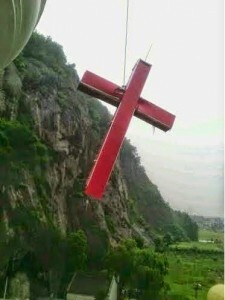 China Aid published a report this week, listing 64 churches that had been demolished, had crosses removed, demolished or covered, or received demolition notices. Events in the compilation occurred both before and after the demolition of Sanjiang Church’s building. After the April 28 demolition of the imposing, 30 million yuan (US $4.8 million) Sanjiang Church building, authorities have turned their attention to local, low-profile house churches, threatening them to quit gathering.